4.73% now. 5% in a few weeks. Then 6%. 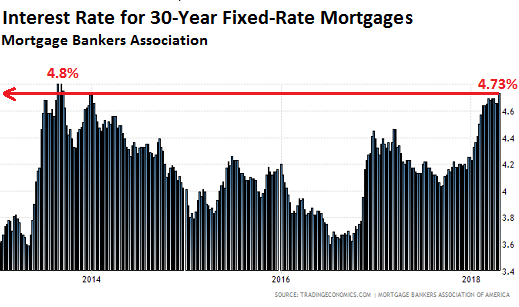 And since mid-2016, mortgage rates have now risen a full percentage point. Points – these pesky upfront fees, such as origination fees, that are usually plowed into the mortgage balance – rose 3 basis points during the week to 0.49% of the mortgage amount. But there is a difference between those higher mortgage rates now and the same rates back then: Home prices! Depending on the metro area, home prices have surged over those years, while incomes have not, and now the free lunch – the combination of rising home prices and falling mortgage rates – is over. Fearing even higher mortgage rates in the future, home buyers are rushing to take out mortgages while they still can: the Mortgage Bankers Association’s Purchase Index, which tracks the number of purchase mortgages (as opposed to refis) that were originated during the week increased 11% compared to the same week a year ago. 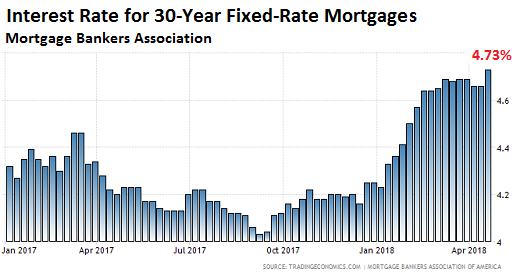 The pain threshold for the US housing market is at 6% (average 30-year fixed-rate mortgage, as measured by the MBA, conforming, with 20% down). That’s my story, and I’m sticking to it. There may well be a cold-shower effect at around 5% that will sober up some home buyers. But pain will set in at around 6%. People have forgotten what a 6% mortgage feels like though that’s still a historically low rate. And they’ve never had to finance homes at these sky-high prices at 6%. That’ll be the new thing. And something will have to give. 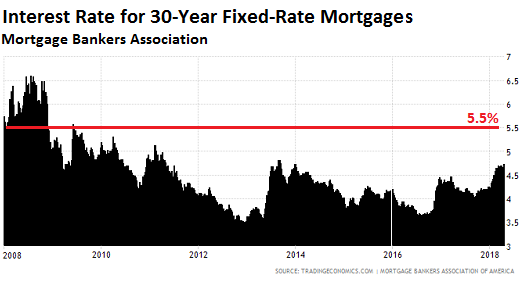 This entry was posted in Credit markets, Economic fundamentals, Guest Post, Real estate on April 26, 2018 by Yves Smith. Odd that the Market reacted (retched) as it did. You would think Neolibs would be dancing over a win-win. Fewer homeowners means more rents to indenture the masses. Higher interest rates mean – more rents via interest. Woopie! There is another big surprise coming in housing that still is not being brought up. The quality of many of the newer homes and remodels (since the 1990’s) are not nearly the median build quality of the homes built previously. From windows to appliances there is no expected life like there once was. The replacement and repair costs as a percentage of housing costs are going up and will continue to grow making home ownership even more unaffordable for most. I believe these increased costs will also affect Private Equity Real Estate Trusts to a far greater extent than they have forecast. Yes, they are built at the lowest price per square foot as much as possible. A few years ago, I toured a showroom with a colleague who was considerably older than me and was thinking about having a baby. I was shocked at how poor the quality of even the showroom housing was. For laughs, we also saw the Mcmansions, even though they could never afford one. Terrible quality as well. It seems so wasteful as well. We are seeing families pay higher than ever prices for housing of terrible quality and increasingly, getting deeper into debt at a higher interest rate. This is a recipe for many family bankruptcies. Wages will not keep up. Another problem in big cities is that the cost of driving will be high and the daily commute will be stressful. I think that housing, if built, should be designed to last. Insulated concrete form is what I would consider the minimum. Another option that would last is a monolithic dome. I’m here to tell you that the Arizona Slim Ranch House is built like a brick shhh-house. Thing was built in 1956. With real two-by-fours and sturdy brick. It also wouldn’t meet current energy codes (in CA, at least). Retrofitting the ranch house with better insulation, dual-pane windows, and better HVAC (and possibly solar panels) is likely in order. I agree that crapification of housing is a big problem currently and a huge ripoff of new home buyers who will have to sink further money into their new houses to make them livable over even a relatively short time. But I’m not sure more durable housing is necessarily the solution to that problem. A huge amount of energy and material is wasted when ever a “durable” building is torn down to make way for something new. And when old buildings are not torn down but simply lived in, they are almost always extremely wasteful of both energy and space. It would be a very good thing if builders began to plan for a limited durability of their constructions with an eye to easy replacement and recycling of components. Ultimately, it is proper maintenance that provides longevity to the built environment, no matter how well it is initially constructed. Building to reduce maintenance is a fine idea, but building to facilitate easy maintenance and to allow for significant change over time that does not require the complete destruction of components would be a smarter way forward than simply building things “to last”. This is a huge problem when addressing our infrastructure. It is so expensive and so disruptive to upgrade because it was built by people without a thought of what might come afterwards. So much of our infrastructure is constrained by decisions made a hundred or more years ago when it was originally installed and designed “to last”. We ought to be seriously thinking about how to design things to be replaced and modified and not forge too strong a link between the concepts of durability and quality. Japan has a housing culture that makes for fewer durables. Wonder how that looks with regard to their carbon footprint though. Not to mention that legislatures are getting ready for the next bust! Washington State just passed a law that makes the promissory note immaterial. The crooks can now begin the nonjudicial foreclosure with ZERO evidence of ownership of the debt obligation. Wait, what? I live in WA and have not heard about this. What did I miss? That’s a “blue” state, too. Such a law is deeply corrupt – I didn’t realize it was that bad there. 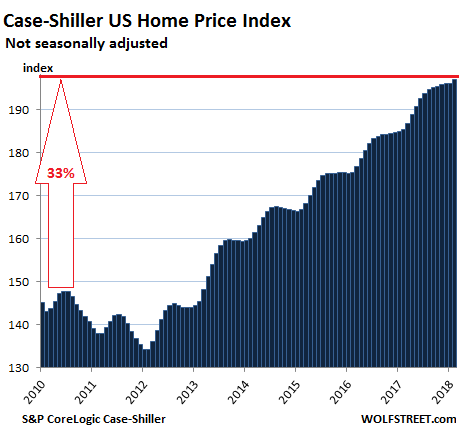 Housing price physics: What goes up must come down. Aren’t we too committed to the housing bubble to quit now? See any moves by any states or the Federal government to rein in prices, as has been done in Canada? Local (‘burbs of Kansas City) peak bubble indicator: House across the street sold 1st day on the market for more than the asking price. Nothing particularly special about it either – 3 BR / 1 bath / basement / 1 car garage, mid 50’s ranch. And they’ve never had to finance homes at these sky-high prices at 6%. That’ll be the new thing. And something will have to give. Indeed, bubble II is likely to be devastating for many; yet another giant asset grab by the Capitalist class. What would happen, however, if they left interest rates at historic lows? More debt, bigger bubbles, and mother of all explosions when they inevitably pop. That is why the US Fed is frantically trying to raise rates now – trying, probably too late, to reduce the size of the inevitable crash. …and Savers would continue to be devastated. As the 26-week T-Bill hits 2% some of the ancients see relief.